Wake up and Hate food. My 6am alarm is entitled wake up and eat food, but when I rolled over in pain and blurrily read my screen, what I saw was the above. My immediate reaction was "that sounds about right", and I attempted to roll over and go back to sleep. However, my 5:30am alarm is my morning meds alarm, so my stimulant was in my system long enough to push back with a "nope, it says go eat, get up and eat". So I get up, perch on the edge of the bed, grumble a bit to myself, and ask my mother who is passing the door of my room, on her way to the kitchen if she wants to hear something funny. She says maybe. I tell her what I misread, with the context of what it actually said "Wake up and eat food" and she is amused*. *Side note my past and present tense get all jumbled, my apologies to the reader. I continued with some word play, as I followed her into the kitchen, based on the song "Personal Jesus by Depeche Mode", but I can't recall the specifics even a half hour later (6:36am). I believe I sang "Wake up and hate food" to the tune when I began, and Mom recognized the tune but not specifically the song or artist. I believe I made a reference to "Reach out and touch faith" which I often change to "Reach out and touch Faythe" which further cemented the connection, although Mom didn't seem to recall the song in detail. I recited the artist and title like an AI on a device, border-line robotic with carefully crafted vocal tone. I announced the say was an especially literal day. I experience time in an unusual way. I don't experience it properly linearly. I suspect this is why my verb tenses always give me trouble in writing. For me, time is more like a great expanse, all of space, the universe, in every direction, ebbing and flowing in ways the human mind cannot process. I have tried to explain this before to friends and family, sometimes in passing, and sometimes in great depth hoping to strike a chord, and understanding of how I experience things, and why time-related memory is such a tricky thing. Alarms set on my phone, to try to function in the "linear time" world. * 6:00am, "Wake up and eat food"
* 9:00am, "Eat a small snack"
* 1:00pm, "Drink nutritional shake"
Sometimes there are additional alarms set for temporary medications, or times are altered to account for temporary situations, like if Faythe is staying over, and wants to be awake at 8am so that we can do something during shared awake time. That time is optimal for our current sleep cycles and maximum functionality in a 2-3 hour window. Once she is awake and has done her morning routines and I've done mine (interrupted today to write this, which felt important) we have about 3 hours before my medication doesn't help me enough to function, communicate, operate at a basic level with other humans. **Health. I'm fairly certain I haven't given great detail in any way as to what I've been experiencing, changes in diagnosis, changes in treatment, here or anywhere in quite a long time. I apologize for that. Because of the way I experience time, as noted briefly above, I don't really process how much has passed within a day, let alone as days run into weeks, months, etc. I have quite a list of diagnosed conditions. I think it might be easier as bullet points. Easier to follow and process than my stream of thought style of writing at least. I keep an updated list of diagnosed medical conditions and current medications on my phone in the ICE (In Case of Emergency) entry of my contact list, under notes, as well as full memos as backup incase EMTs don't check my contacts. At some point soon, preferably before I turn 35 this summer, I'd like to get a medical alert bracelet that is inscribed telling medical personal to check my phone before adminstering medication. I should also make sure I have an updated list of medications that I have had adverse reactions to. What this all boils down to is that due to brain fog from the chronic migraine, or pain fog, or both, I require quite a list of medications to function at a very basic level. Trying to function day to day is often painful grueling work, done with whatever smile I can grasp. It's taken many years of constant breaking-point debilitating pain to have that pain taken seriously, which is sadly not at all unusual. My doctor was appropriately skeptical when I came into his clinic initially, but as time has passed (not sure how much time, between 1-2 years) and he has been able to see me at my functional best, and also at my cognitive worst, he believes me. At out last appointment I couldn't string sentences together properly. The words were out of order, if I could grasp at words, and most communication was body language, fixating on the words I could manage, arguing to myself that those were not the words, and expressing explicit desperation. Our temporary fix was to tweak my stimulant to a slightly higher dose, and double the dose of my "as needed" migraine medication. For the moment, that combination of changes has given me some functionality. The first few days I had higher anxiety in the morning, adjusting to the new levels of the stimulant, and the first couple of times I treated migraine, I had unholy migraine hangover like I haven't experienced in a long while. However, for a brief 5 hour period, my pain went from a solid and unquestionable 8 on the pain scale of 1-10, to a 3. For FIVE SOLID HOURS. It took another 12 hours or so for the pain to ebb back up to that solid 8. I try really hard not to discuss my pain, or my suffering because I don't want to burden my friends or family, and I often feel trapped within that pain. I want to discuss other things or do other things if I am functional enough to communicate. That said, while I am able to function to this degree, documenting it is important. I don't know how long this combination will work to allow me to function, and I don't know what we are meant to try next as I'm fairly certain my doctor is grasping at straws trying to find anything we haven't already tried to help me. I can't or won't promise to post more regularly, because each time I do so, I end up bedridden for months afterwards, and I refuse to make a promise I know I am unable to keep. What I will do, is promise to try to check in more. That's all I can promise. There is a phenomenon I like to call "Cotton Candy Sky" that I've only ever seen in Texas, specifically in winter, in the brief moments of sunrise during an infinitesimally small window of 30 seconds to maybe 3 minutes at the very longest. In this moment the sky is shades of vivid teal, starburst strawberry pink, and vivid candy lemon yellow where the sky and clouds touch. It is gorgeous, and I've never been able to capture it on film or digital camera because the sky only looks like this for a very brief moment, and by the time I grab camera, or phone, the moment is over. I've never seen this particular phenomenon anywhere but Texas (specifically DFW sky, which differs greatly from South, Central, and East Texas skies). It doesn't even look like this in Oklahoma with the same specific criteria. What I've noticed about this effect is that it must be an unusually cold (for Texas) morning, with clouds that look like snow, but spartan. Specifically I think they are sirius stratus clouds spread incredibly thin across the sky. Something that I think contributes to the uniqueness of this moment, is how vastly HUGE the Texas sky seems compared to anywhere else I've lived. Our trees are short, our hills and valleys pretty subtle at this part of Texas which is part of the Great Plains, or Great Plateau, depending on where in DFW you live. I saw beautiful, so far un-captured, moment the most as a teen attending early morning seminary before school. Mormon kids in states other than Utah generally attend before school, getting up 4-5am, depending on their family routine and when school starts, and class is usually an hour. During the darkest days of the year we often got out and headed to school just as the sun was rising, and as a passenger I was able to pay this otherworldly beauty more attention than my parents or older siblings who were driving. I also was far more likely to have been up all night, and much more awake at that moment than anyone else, since my circadian rhythm has always been off. I will attempt, because the weather is right, to try and capture this on my phone's camera hopefully at least once over the next few mornings, because when I mention it, no one seems to believe me. I am given a "sure whatever you say Rory" kind of look, and a sympathetic smile, because I'm a dreamer, and an artist, and I see what others do not see. To be clear, I've watched sunrises in Illinois during similar weather where the criteria would be met, in Virginia Beach, Virginia, and in various places throughout the US on road trips when I'm loading up the car. I've seen lots of beautiful sunrises, but never THIS sky. The 'fun' of panic attacks at 6 in the morning. I heard my alarm go off at 6am, as it does every morning, reminding me to get up and eat something. This is a standard part of my day, and goes off after my 5:30am alarm which gently reminds me to take my morning medications. However, this morning I heard would might have been either hysterical laughter or desperate sobbing from the next room, which is my mother's bedroom. I rose, stumbling into the hall and listened at the door, unsure of exactly what to do for a moment, then segued into my restroom to pee instead, and attempt to gather and process my thoughts. I heard Mom's pleasant upbeat voice moving toward the kitchen, witch further compounded my confusion and anxiety into full blown panic. If something was wrong, was it with me, or with her? Was I hallucinating? Has my Holiday Anxiety switched over to full-blown psychosis? No, at least, not just yet. Mom was in the kitchen preparing her breakfast when I stumbled in and asked in a jumbled up way, what exactly I had been hearing, explaining that it might have been hysterical crying or laughter, but based on her current emotional cues seemed to be neither? It was a Soprano, singing a French version of a Christmas Hymn, via our local classical music station, which is Mom's choice of wake-up alarm. It was certainly alarming to me at least. With a brief back and forth explaining the main difference in the French version of the Hymn versus the more common to hear in America, it was made clear, the desperate sobbing or hysterical laughter, was song, muffled through the wall, variable by musical choice and passion, rather than pain, despair, or a really good joke on Facebook at 6am. I was not yet relieved. I explained my concern, given that Mom has been fighting both a kidney infection, and the infection known as cellulitis over the past week or so, my concern was severe, and was she actually OKAY? She assured me that she was, and kindly helped me to prepare breakfast (cottage cheese, with fruit for me, and usually half a Cost-co muffin for each of us). Last night Mom was inspired to bake, and she made some little muffins about 1/4 the size of the generous serving of a Costco muffin, so we had two of these each to begin, and ended up going back for two more apiece. She made something from one of her collection of cookbooks, that had the texture roughly, of a corn muffin (like corn bread but as a muffin) but more moist, and with bits of fruit inside. These had dried cranberries substituted for currants, and mango marmalade, substituted for standard marmalade. They were good, somewhat saltier than expected, falling somewhere between sweet and savory in the flavor profile, but very definitely good. Mom did ask for feedback last night, and I shared mine as we sat and ate. I think soaking the cranberries in a juice would help plump them up for future baking, and I felt that at the level of savory flavor and texture, they could do well with cheese, or cheese and little bits of ham. My response to panic is to assess the situation, verbally dissect it (well past the point of death), and then fall apart and apologize. I do well in crises, honestly. I can hold it together and assess, direct, take (or relent) control and make sure the situation is properly corrected/diverted/etc, but I fall apart after, and it's not pretty. My early morning experience today ended with my literally crying into a muffin, apologizing (repeatedly) for being unable to stop speaking. I also helpfully offered to cry for Mom since clearly that was all I was capable of doing, and was there anything I could help her grieve with? This could be funny (odd, interesting to study) if this weren't what I experience with EVERY DAMNED Panic Attack. I'm pretty sure Osaka and my mother have the patience of Saints. Good morning to you all. I'm hiding in my room with my returned migraine until quite possibly Christmas morning. I am slowly going through and attempting to recover/replace links that I had been using photobucket for. Some images I'm hosting through Google, and some may be hosted through Instagram. I haven't worked out if there is a way to share directly from there to here yet, but I'm looking into it. I am recovered mostly from the upper respiratory ick, and am on my way to feeling more normal (for me at least). I had a follow up with my primary physician on Monday and was healthy enough at that point to receive a flu shot, so yay! I prefer to try and get mine around September but I've been too consistently ill. I'm actually using my laptop today, because accessing images is fiddly on my phone, and I do have all my photos backed up on my external harddrive, so it's just a matter of finding them in my organizational nightmare, and uploading, replacing links. Photobucket is holding my account(s) hostage as everyone else, but I've been able to sign in and look at what the links are so I will be screengrabbing all of that so I have a better idea of how to fix at least the last year's worth of broken images. If I'm feeling ambitious I may go all the way back and re-upload, but that's like over a decade of MUCH MORE active posts and not everything was hosted through photobucket so, we'll play that by ear. My Thanksgiving was blessedly drama-free (or at least, lower than expected levels) so that was awesome. I hope that everyone else also had a great holiday! My mobile settings have gone off-kilter, specifically with my web browser. There was an update and a bunch of customizable settings were removed or replaced, and I'm trying to figure out which. In updating things, I've been sick off and on since at least July. A couple of kidney stones, the diverticulosis diagnosis, 2 modified diets for a month each, a skin infection, innumerable migraines, and currently an upper respiratory infection that has me concerned. I saw my doctor yesterday and we determined it had the potential to become pneumonia, so I'm on heavy duty antibiotics, prednisone for duration, and a follow up appointment on Nov 27th. We discussed potentially re-upping my pneumonia vaccine, as well as a now overdue flu shot if I am healthy enough when I see him next. I have mostly been completely offline. I have Instagram but I've been so utterly and completely dead from illness and fatigue that I have not been online at any time longer than a couple of minutes. I went to the ER last weekend, Friday night, and they kept me through midday Sunday. I have another (this would be the 8th I'm aware of in 2 years) kidney stone, but they were more concerned with what turned out to be Diverticulosis. After some research it seems to potentially answer why so many frequent kisney stones from an otherwise healthy kidney. Apparently other organs throwing a fit (including but not limited to kidneys throwing stones) is actually very common with onset of Diverticulosis. Also it is unusual but not unheard of in people as young as me. I just turned 34 mid July. I don't know if it's a common comorbid condition with EDS and POTS, but I would be surprised to learn otherwise. The joy of autoimmune diseases is that they like to trigger each other in a seemingly never ending chain of pain and medical confusion. Hmm. So I think I may have an ER visit in the next day or two. My left kidney is inflamed (again) and it threw a stone, which I've already passed on July 24th. Today is August 16th and I've had visible surface bruising (confirmed by Faythe and Mom) for 2 days over that kidney and next to my spine. I brought up my continuing pain at my regular Dr visit about a week and a half ago. My doctor prescribed a very limited script of Norco for the 10/10 pain days, and I've actually had to take it two or three times THIS WEEK which is pretty unheard of for me. I have a ridiculously high pain tolerance and I've been debating the pros and cons of an ER visit for at least 5 days now. I'm trying to hold out until Friday. If it gets better then I will follow up with Dr and maybe ask for bloodwork. If it doesn't, it's probably an emergency. I always feel like I'm over reacting about my pain or health even though if I am even considering an ER visit it is 100% of the time something serious, and often far more serious than I had guessed, probably because I put it off. So.. I guess if you pray, pray it's not a kidney infection or anything that is likely to kill me. This is part of why I fall off the grid so often. I'm sorry. I miss you guys and hope to catch up with y'all soon. I never mean to fall off radar. Planned breaks from internet or other formats are announced ahead of time if and when thry are intentional. I had been switched from Ritalin to Concerta for treating ADHD, but the Concerta made me lethargic and didn't help with focus. Combining that with increased difficulty breathing, erratic body temperature, and erratic changes in blood pressure, it was too dangerous to continue. So I've been swapped again but I don't know the name of the new medication. I started a week ago tomorrow, I believe. I don't remember much since my early birthday party which was also on the first day of Concerta. I've missed the fall deadline for school, so I'll be attempting to iron out details for resuming in spring, health allowing. If I can figure out how, I will share pics from Instagram. I'm sure there is a way but I don't have the spoons to figure it out just now. I have been painfully absent for I'm not sure how long. I think my doctor started me on the Ritalin about 3 months ago and it helped me to focus for school but it also ramped up my anxiety and the adjustment period where the person is less hyper reactive after a little while just never came. I didn't realize the severity of it until I started the new ADHD medication Saturday. A friend hosted a small and absolutely wonderful birthday party and present me with an amazing customized gift and it was all really great and felt low key despite excitement and sugar from cupcakes and uncooperative weather. I told her towards the end of the party that I was on the first day of the new medication and had been a bit anxious but didn't want to ruin our carefully coordinated plans, and she went way above and beyond what I had expected so my calm acceptance and real visible gratitude was in stark contrast to how I've been reacting to surprises for YEARS. This was also in drastic contrast to July 4th, when I met youngest sibling's fiance in what should have been a safe neutral place for me (the home I share with my mother), where I was keyed up and anxious and aggressively reactive which I've been on a sliding scale to UH-OH, since starting the Ritalin. I like future brother in law from what I gleaned and I had an embarrassing painful meltdown and lashed out at EVERYONE present before silently hiding in my room. I asked youngest sibling for a current email and carefully drafted an apology to her and him, and apologized profusely to my mother and other younger sister who were both present. New med is Concerts, which is a gentler extended release medication and it's like day and night. I wrote some notes up day 1 between carefully preparing last minute things for the party, and I'm stunned. I remember this more than lithium, and if I was worse on lithium I'm ashamed, and thankful that I have any friends left at all. I may put some of my notes to my doctor about day 1 impressions below. First day on the Concerta. Immediate thoughts. More gentle onset. Instead of waking vaguely conscious and immediately shifting to AWAKE and more than slightly anxious, I have had a gradual shift from awake? ..morning fog. Oh, awake. Reasonable list of tasks. Pondering tasks. No immediate onset of frantic anxiety screaming that we must do ALL the things and right this moment. Still able to focus minus the frantic anxiety of "oh crap so much to do, I can't do these things. *OVERWHELMED*"
Still very much aware of what needs doing. And actively working on it without the overwhelming suicidal pressure of MUST FOLLOW THROUGH ON EVERYTHING WAY BEFORE SELF IMPOSED DEADLINE. I hope this med stays at this level of helpful focus without triggering my flight or fight response like I was having. Especially notable that I am not apathetic, just reasonably calm. This morning I have showered, had breakfast, done some low key prep for things we are taking to the party, emailed (my doctor) about potential interactions, updated my medication list including further details on each medication (exact dosage and chemical name and more accurate dosing timeframe). I will be helping frost cupcakes and looking further into disability application prep before the party this afternoon. I have been more quietly, **non-aggressively productive in the 3 or so hours of today than the last month. **Important note. I was productive but INCREDIBLY aggressive on Ritalin. I'll further note changes in behavior as noticed. Doesn't feel intense like the Ritalin often did after eating. Passage of time feels a bit slow but that's kind of a relief after feeling like running full throttle for months. I'll need to be careful with time management as I'm less aware of time passing today than say this time last week. I still need to figure out a new photo hosting option because Photobucket has pissed the bed, but I'm using Instagram and Google images, so I may be able to do something with that. I am pretty sure I have a Flickr but I don't know how to use it and the set up is awkward fot me to look at and navigate. Oh the awesome customized gift was an American Girl as boy with green eyes and either black or very dark brown hair. I've been calling him Malibu Rory. Faythe has been looking for free source patterns so we can make him some things but he has some cute sailboat trousers so priority is probably a t-shirt or the like that. Andi also gave me some lovely bits for my SD dolls, but apparently I didn't take a photo. I'll do so later today I think. *Diet has been erratic since school ended, compounded my Faythe's medically restricted diet. *SEVERAL OF MY MEDS CAN CAUSE WEIGHT GAIN. ALL ARE MEDICALLY NECESSARY. *My primary physician agrees that I should apply for disability. *Non-stop migraine. Literally always there, but less killing me than last year when I was doing work and school full time. *My (adult) niece Ashley has secured a job in Chicago and we are all incredibly proud of her. She is having a small going away party today which I will be attending. She starts I think on July 5th, maybe 10th. *I'm having a small doll folks birthday party Sat July 8th, hosted by a local friend. *I'm hoping to find enough spoons to finish at least one of Robbie's Marvel t-shirts by then for photos. *Faythe told me about a cake recipe she learned that will make it possible for her to have cake sans frosting and we are doing a test run today. If they work we will take thrm to Ashley's party. If not, Mom has a backup plan, coconut cake, gluten free. *I am in a constant state of wildly swinging from depressed, crippled with pain, just functional enough to do things, and DRIVE TO DO THINGS with no spoons. I have literally tried to write ANY kind of post for a month now. I'm sorry. I turn 34 on July 14th. I need to get in gear to argue with the school so that I can continue education but Faythe's health has reasonably taken priority. I'm concerned but not freaking out. I'm Rory or Rorek in most places. I design, sew, and craft, primarily for my Asian Ball-Jointed Dolls. I also dabble in interior design, but I'm a little out of practice. 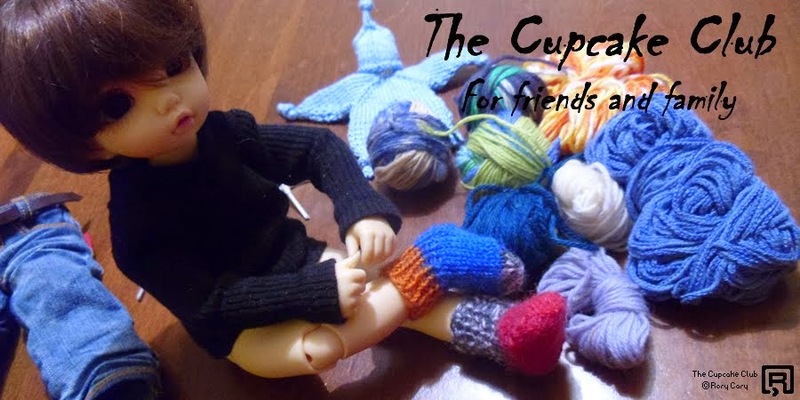 I post about the things I enjoy, which are sewing, photographing my dolls, designing new outfits, knitting, which I started in September of 2008, thanks to my Mom, and occasionally drawing, or painting. I also post about Life Events and how they affect me and those that I love. Currently I am living in DFW, Texas in the USA and working towards a degree in Theology.